Editor's note: Science teacher Dominique Evans-Bye will discuss her efforts to implement a GIS-based CTE program for high school students during a presentation at this year's Esri Education GIS Conference. In the following article, she outlines some of her ideas about the program. Few, if any, students sit in a traditional high school English, math, history, or science class and think, "I can get a job doing this!" Often a disconnect exists between what is taught in the classroom and what students see as relevant to their future. However, there's a way to get students more interested in academics. Geographic information system (GIS) technology taught in the context of career and technical education (CTE) can bridge that disconnect and get students to apply what they learn in core subject areas. CTE teaches students how to connect what is taught in the classroom to a future career. Clark Magnet High School student Yeprem Chavdarian learned to use GIS in classes taught by Dominique Evans-Bye. Core academic subjects provide essential skills necessary for an educated work force. GIS classes embedded throughout the high school curriculum increase students' interest in school, engage them in using multiple sources of knowledge to solve complex problems, and provide them with marketable skills to use throughout their lives. Historically, CTE classes have been aimed at students who do not plan to pursue higher education. Traditional CTE courses, which included classes like auto shop, cosmetology, or woodworking, were all designed to train a blue collar work force by giving students entry-level skills for the job market. Recently, however, colleges and universities have shown an increased interest in the development of CTE programs. The University of California has developed a curriculum integration project that recognizes the need to make education more relevant by integrating rigorous instruction, CTE, and an academic curriculum. In this model, CTE instructors work with high school teachers to integrate core standards and CTE standards and thereby show students true applications of academics for a career. For example, the University of California has approved a course Clark Magnet High School will offer called The Geology of Disasters: A HAZUS-MH Training Course. This class will bring together academic insight into the geology behind natural disasters and GIS training using the Federal Emergency Management Agency's (FEMA) HAZUS-MH software. HAZUS-MH assesses risk, estimates economic loss, and analyzes mitigation strategies for the potential damage that earthquakes, floods, and hurricane winds can cause. CTE's value is that students can actively explore career opportunities. Biology has many fun and exciting career applications that often don't get communicated through traditional classroom instruction. For example, a CTE integrated biology class could incorporate a GIS lesson on deforestation or use GIS to illustrate the historical versus current range of an endangered species. GIS instruction lends itself to a self-directed and self-paced format. Students who have grown up around computers quickly learn the basics. For students who have little access to computers at home, GIS helps foster basic computer literacy. Critical thinking is developed as students learn to use geoprocessing tools for data analysis. Students become active researchers as they gather data, prepare their data for analysis, organize the storage of their data, choose appropriate geoprocesses for the analysis of their data, and format the data for presentation. Mapmaking also encourages artistic expression. Cartography teaches the use of color, balance, and feature hierarchy to communicate information. A map that is attractive and easily understood is more likely to be consulted over one that does not follow basic cartographic principles. Today's students take a greater interest in projects that benefit the environment or their community; they are empowered to make a difference. GIS is a perfect match for service learning projects. Students learn teamwork, and outside partnerships are forged as students bring their project management, communication, and critical-thinking skills to the task. Many of these projects bring recognition to the students and their school. 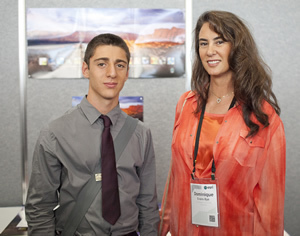 Yeprem Chavdarian, a senior at Clark Magnet High School, presented one of his GIS projects on stage in the 2011 Esri International User Conference Plenary Session. When asked what impact GIS had had on his life, Chavdarian said, "GIS has opened opportunities for careers I had never thought of before and has shown me the direction I will take in college." To date, Clark Magnet High School students have won over $145,000 in grants and scholarships by entering GIS projects in environmental science competitions. Their accomplishments have attained nationwide recognition, and the students consistently produce college-level work while managing a tight timeline. Student projects featuring HAZUS-MH analyses so impressed FEMA officials that they recommended that the City of Glendale collaborate with Clark Magnet High School to update the Local Hazard Mitigation Plan (LHMP) that is required for the city to be eligible for federal funding. "The City of Glendale is excited to partner with the students and is extremely impressed with their knowledge and professionalism," said Glendale Fire Department battalion chief Greg Godfrey. "It is through this partnership that we will be able to meet our goals and complete the LHMP with the most updated and current information." Can there be any better way to prepare students for college and career? Dominique Evans-Bye teaches biology and GIS-based CTE classes at Clark Magnet High School. She holds a BS in environmental biology and an MA in GIS.